As the co-author of Flash For Dummies, I’m always looking for ways to do in PowerPoint the kind of animation that you can do in Flash. 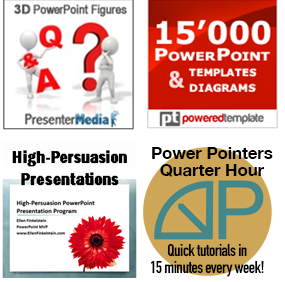 Flash has more sophisticated animation tools, but you can often create surprisingly good results in PowerPoint. This animation was inspired by Nancy Duarte’s book, slide:ology. In Chapter 9, Creating Movement, she shows an animation of a bouncing ball. She doesn’t explain the details of how to create it, although she provides some hints, so I had to come up with this myself. 1. A curve motion path to bring the ball onto the slide and down to the ground. 2. 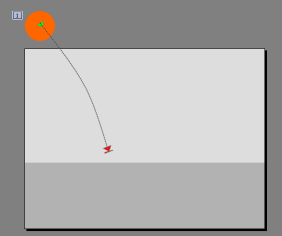 A Grow/Shrink animation, set to Vertical only, to shrink the ball to an oval as it hits the ground. 3. Another Grow/Shrink animation, also Vertical, to return the ball to a circle. 4. A curve motion path to bounce the ball off the slide. 1. Set the background to anything you want. You could use an image to create a background for the ball. 2. Draw a rectangle at the bottom of the slide. Right-click and choose Format AutoShape (Format Shape, in 2007). Remove the line around it and change the fill color as desired. 3. Draw a circle and in the same way, remove its line and change the fill color. 4. Drag the circle off top left corner of the slide. Reduce the zoom of the slide to make this easier. 6. Choose Add Effect> Motion Paths> Draw Custom Path> Curve. Draw a curve from the middle of the ball to just above the bottom rectangle, about 1/3 of the way from the left side of the slide. You’ll probably need to adjust the ending point later, so don’t worry about the exact point. 7. The ball needs to “squish” as it hits the ground. With the circle selected, choose Add Effect> Emphasis> Grow/Shrink. If this animation isn’t on the list, choose More Effects to find it. From the Start drop-down list, choose With Previous. (You’ll change the timing slightly later.) From the Size drop-down list, choose Vertical. From the same Size drop-down list, enter 75% in the Custom text box. Set the Start to With Previous. Note: If you choose Effect Options from the first Grow/Shrink animation’s drop-down list, you’ll see an Auto-Reverse check box in the dialog box. This reverses the animation and will make the oval return to a circle. However, I found that this didn’t give me the control I needed over the timing, so I didn’t use it. 9. With the circle selected, choose Add Effect> Motion Path> Curve. Draw a curve off the right side of the slide, not as high as before. As Nancy Duarte notes in her book, “the height of the arc is shorter on exit due to energy lost from impact.” In the Start box, choose With Previous. 10. Click the Play button in the Custom Animation task pane and see how it looks. You’ll probably notice some problems. If it doesn’t look right, set the Speed of all of the animations to Slow. This will help you troubleshoot. For example, the Vertical Shrink shrinks the circle from its middle and you’ll usually need to make some adjustments to get the ball to appear to hit the ground, yet not go below it. Then select the first curve and move it up or down, or stretch it by dragging on a bottom handle, until you get the result you want. You may need to adjust the second motion path curve’s start point as well. 11. You’ll notice that the Shrink effect starts too soon, before the ball hits the ground. Yet you want it to end at the same time as the first motion path. 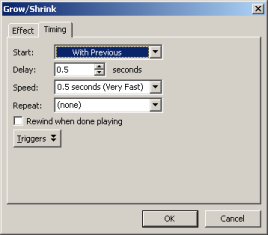 To fix this, select the Shrink effect, and choose Timing from its drop-down list. In the dialog box, set a delay. I used 0.5 seconds. 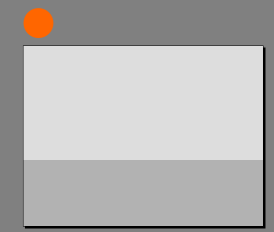 Tip: You can also choose Show Advanced Timeline from the Shrink effect’s drop-down list, and drag the left side of the timeline bar to the right. This delays the start of the effect. 12. When the animation looks good, change the speed of the two motion paths to Fast and the two Grow/Shrink effects to Very Fast.